The Bhagwati Automatic Volumetric Vial, bottle filling machine, which is made compact, versatile and enclosed in stainless steel elegantly matt finish body. This unit works on volumetric principal and reciprocating self-centring device. Conveyor Height 800 mm to 940 mm Adjustable. The unit is made compact & versatile · S.S. Slat conveyor. · S.S. Elegantly Matt Finished Body · No Container No filling system. 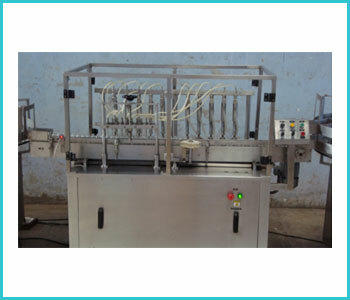 · Reciprocating Filling nozzle with self centring device · Variable A/c Frequency Drive.